The WWDC keynote clarified Apple's Post-PC vision and hinted at disruption and competition to come. The Worldwide Developers Conference (WWDC) keynote by Apple CEO Steve Jobs was pure “shock and awe,” a showcase of the overwhelming power that has been assembled and orchestrated by Apple, the industry’s emerging Post-PC gorilla. What follows are my four core takeaways from the keynote. Three years ago, I wrote that Apple had made, and was brilliantly executing on, a handful of trend bets that left it uniquely positioned within the marketplace. Making the mobile Internet caveat-free. Harnessing rich media as the “my stuff” bucket that matters. Treating everything in their arsenal as an integrated platform (from PC to device to online service). Leveraging and deriving core technologies from one product family to cross-pollinate another. At the WWDC keynote, Jobs and company repeatedly asserted that “it just works” (the ultimate caveat-free mantra) when presenting this feature or that. They noted that no one else can assemble all of these pieces to deliver this type of solution. Personal media: Via camera enhancements, which use Apple’s Core Image camera technology, and a new Photo Stream service, which will run on iPhone, iPod Touch, iPad, Mac and the Apple TV. Personal documents: iWork now runs on everything from the iPhone and iPod Touch to the iPad and the Mac, and it’ll soon be cloud-enabled via Documents in the Cloud. Messaging/scheduling/contacts: Via the new iCloud service, which revamps and subsumes the company’s disappointing MobileMe service. The new iMessage offering is poised to disrupt the SMS business. Professional media: Via iTunes in the cloud and a new iTunes Match service; a new magazine and newspaper subscription service called Newsstand, which complements its iBookstore; and unique to Apple, liberal rights to use the same media now and into the future on multiple iOS devices. John Gruber has a great analog for how Apple approaches markets, strategies and tactics that he calls, “Measure Twice, Cut Once.” The basic premise is that while most companies have a tendency to fire, then aim, Apple is diligent in assessing all of the moving parts of a strategy, and ensuring they have extreme confidence in both the viability of the path and their ability to execute on that path. Hence, while many mocked Apple’s slow path to copy and paste in iOS, their handling of Antennagate, and their seeming lack of urgency in responding to Google’s cloud ambitions, the truth is that Apple begins with a 3.0 vision that guides 1.0 execution. This “begin with the end in mind” sensibility and patience has repeatedly rewarded the company and its constituency. This week’s announcements were no different. 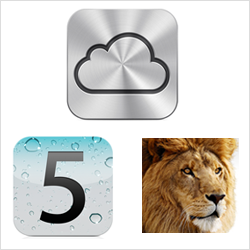 In announcing both iOS 5 and iCloud, Apple for the first time gave users clear workflows that don’t force false dichotomies between the PC as proxy, and the cloud as the hard drive in the sky. You can cut the cord or not. Software updating and iTunes and App library syncing don’t demand a host PC. Nor does photo or video editing. Nor does creation of calendars, mailboxes, documents or the like. At the same time, they have delineated the cloud as The Truth, relegating rather forcefully the PC (and the Mac) as just another device from a backup, syncing and service perspective. Categorically, this puts them in a real sweet spot between the lowest common denominator web tilt of Google, the PC legacy catholicism of Microsoft, the device-agnosticism of Facebook, and the digital disruptor that is Amazon. Two storylines always seemed obvious when Apple began its assault on becoming the digital hub. One was that long-time friends, Apple and Google, were destined to become frienemies. The second was that the only company positioned to fight Apple in terms of both style and substance was (and is) Amazon. Why? Amazon, like Apple, is singularly focused on how to sell stuff. Both companies are somewhat agnostic to rigid categorical definitions of the types of products that they can sell and the lines of business that they can play within. Equally important, like Apple, Amazon has a relentless focus on customer satisfaction, not to mention, the all-important billing relationship. Plus, like Apple, Jeff Bezos and company know how to execute on platform strategy, are adept at pioneering cloud services, have their own device and integrated app store strategy (via Kindle and their Android app store) and have secured the all-important media relationships across music, books and movies. With Apple moving aggressively into PC software sales, ebooks (the WWDC keynote touted 130 million downloads from iBookstore) and magazine subscriptions, and an Android-derived Amazon Kindle tablet rumored, Amazon seems to represent a potential fly in the ointment of Apple’s ambitions. Whether Apple represents a serious threat to Amazon, however, remains to be seen. This will be my favorite industry storyline to watch unfold in the year ahead. Two tweets that I saw stood out in the waning moments of the keynote, both speaking to Apple’s willingness to kill stuff. The first, by the New York Times’ John Markoff, underscores the admirable quality of Jobs to see beyond long-held conventions and thus to kill sacred cows (even his own in the case of MobileMe). More chilling, however, is Apple’s ready willingness to cannibalize its partners. While inherent in any platform play is the risk that the platform provider will see your sandbox as strategic and co-opt it for themselves, the news wires were legion with stories about the “body count” from Apple’s announcements. In case you don’t know, this is a direct dig at the fact that iOS developer Tap Tap Tap, makers of the popular Camera+ app, innovated this very same feature several months back, but Apple blocked the app’s release until the feature was removed. Now, however, Apple has added it to iOS as their own feature. To be clear, as platform maker Apple is both within their rights and responsibility to decide which features are best left for third-parties to extend, and which are core and thus should be universal within the platform. But I suspect that it speaks to the growing unease that an all-powerful Apple may not be so great for third-party developers, especially given Apple’s past track record of co-option during the PC wars. Such is the paradox of astounding success. One moment, you are being celebrated as a revolutionary, and bringer of a golden age. The next, you’re being taken to task. Apple’s relationship with its developers and corresponding role in their success (or failure) is a topic certainly worth further exploration. But that is a post for another day.